As of the first Monday of April, the Bolles School will officially become the Bolles School and San Jose Hotel™. There are no current plans of complete conversion to hotel status, and thus, cohabitation is currently expected. Unfortunately for the math and history departments, current plans also involve a complete renovation of the second floor of Bolles Hall, whereupon it will be remodeled with hotel suites. As these renovations are taking place, all classrooms will implement fold-out desks that can easily convert from desk to bed. 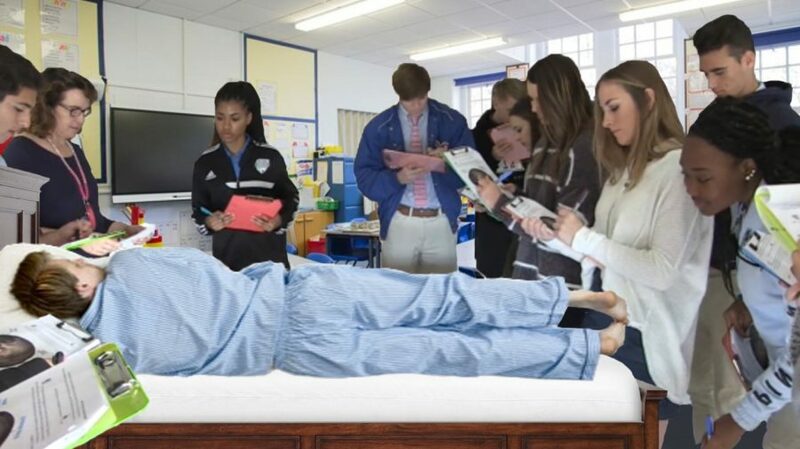 The last class of the day will be expected to pull out the beds or risk receiving a Saturday, whereupon they will assist in tending to the guests. With this transition comes new elective opportunities. Much like office aide, students may take Hospitality or Bell Hoppery accompanied by (unpaid) in-the-field experience. Students in the Hospitality Elective will be expected to tend to guests, and will learn valuable skills such as general cleaning, toilet unclogging, Laundry Folding, and how to Make a Bed. In Bell Hoppery, students serve as porters or bellhops, and must welcome and carry bags for guests, however, the top students may even be promoted to concierge. After much debate it has been decided that Bell Hoppery will go towards P.E. credit. This class will often interact with Hospitality, so be prepared for several joint group projects. Another exciting new opportunity is arising in academic courses. Upon purchase of a hotel suite, guests may agree to a specialized waiver. This allows students enrolled in Psychology to study the behavior of hotel guests for the duration of their stay, 24/7, and for those in Bio to perform tests and observations such as cheek swabs, customarily whilst the guest is sleeping. As an incentive to comply, guests will be offered significant discounts and special perks. Sports will also be affected by this conversion. From 3:45 – 5:45, “Gondola” rides can be booked, with weather permitting, on the St. Johns River. For a romantic evening, or simply a beautiful ride past Epping, the Crew Team will now be rowing guests along the churning waters. With soft music, sunset, and the yelling of the coxswain in the background, the atmosphere will be absolutely perfect. However, great concerns have been expressed over who will be granted pool access. Although swimming is one of, if not the most, prominent and successful sport at Bolles, a pool is practically a hotel necessity. Since the comfort of the guests is paramount, current plans for the swimmers may include, “kiddie pools scattered around campus,” or, “an early early early-morning practice,” as overheard by a concerned freshman. Expect further coverage on this topic if the need arises. Another concern brought up by the administration is that of an underground homework black market developing between the students and guests. From trading essays for free minibar access, to swapping math homework for prompt room service, and claiming AP Sculpture credit for creating towel animals, this could create an unhealthy cheating culture. Even stranger rumours and fears have been heard amongst students. As many know, ghosts are another hotel staple, and reports of chills and strange whispers have cropped up on the second floor of Bolles Hall. Based on strange glimpses of the grey figure, many believe it to be a student who had disappeared mysteriously during a Freshman Orientation Tour. Many say that the whispers are in fact audible, some even hearing the full quadratic formula or quietly-recited Latin declensions. Teachers worry that the ghost may help students on tests, and have taken to lining their rooms with salt before assessments. However, ghosts have a certain appeal, especially in historical sites, and administration is currently debating whether to exorcise it or promote her as a feature of the hotel.